When evaluating the next best-fit monitoring tool for your environment make sure to add MTTI (=Mean Time to Instrumentation) to your list. I don’t think MTTI is an official metric, YET, but MTTI is top of mind of Dustin Hassemer, who is currently evaluating the next generation of APM (Application Performance Monitoring) tools for his current neotemployer. Last week after a workshop, I got to chat with Dustin and he filled me in on why this metric is so important for him as a somebody responsible for enterprise cloud performance monitoring & engineering. In his life as an Enterprise Performance Engineer, Dustin saw MTTI drop significantly with the 2nd generation wave of APM tools. While that was great, Dustin feels it is not enough for the next generation of applications he and his team are tasked to monitor (enterprise cloud platforms, microservices, containers, serverless, …): Dustin needs MTTI to go down to 2 minutes – otherwise he and his team are spending too much time configuring and calibrating their monitoring platform! I promised to dedicate this blog post to his thoughts and idea about MTTI, about how he defines MTTI and how he quantifies MTTI when evaluating different monitoring vendors. As mentioned above, Dustin has seen the evolution of monitoring vendors over the years. Instead of manual code instrumentation, APM vendors leverage dynamic byte code instrumentation during application start. Thanks to recent advances in the application runtimes (Java, .NET, …) and the capabilities of runtime class reloading, it is even possible to change the instrumentation “on the fly” while the app is still running. This makes it much easier to experiment with instrumentation rules and avoids some back and forth with the initial coders. All these benefits are leveraged by 2nd generation APM vendors such as AppDynamics, NewRelic, Dynatrace AppMon and others. Where 2nd Gen APM falls short! Two hours doesn’t sound bad – does it? Not at all if you have a stable J2EE environment that keeps running on the same JVM and the same OS and you have figured out which APM agent to install and which config file to change to tell your JVM to load that agent. That same holds true for your Apaches, NGINX, IIS, Node.js, Python, Ruby, … based applications. 2nd Gen APMs require you to know A LOT about the application you want to instrument, e.g: exact OS version & bitness, exact version of your runtime, exact location of the config file to set your environment variables or startup parameters. And if you just have one of these things wrong you either don’t see any data and you wonder why or your application doesn’t start anymore, and you also wonder why! Today’s technology stack demands an MTTI of two minutes! There are different approaches of bringing down MTTI even further, e.g: provide a smart installation script for all supported platforms and runtimes and automate the necessary installation and configuration steps leveraging modern Configuration Management tools such as Chef, Puppet, Ansible or baking the installation of the monitoring agents into your Terraform or CloudFormation templates. The only challenge with this approach is that you must maintain all these scripts yourself if the vendor is not providing you with these scripts and keeps updating them. Besides installation and configuration, there is another issue that Dustin brought to my attention. He told me that while all the APM vendors that he has used in the past provide great code-level visibility for those transactions that have an obvious performance issue or an obvious error – most of them fall short to provide good enough default instrumentation to understand what causes these issue in case they don’t originate in that one transaction that was slow. He gave me this example: If a single transaction is slow because it must wait for a free socket or free database connection, I get to see that in tool XYZ. What I don’t see is why there are no sockets or connections available. I don’t get to see the code-level instrumentation in those transactions that seem to operate correctly but are the root cause of the issue! Why is it that most 2nd Gen APMs don’t provide good enough default instrumentation? My personal opinion is that most 2nd Gen APM tools have been built for the Ops Use Case. The goal here was to focus on outlier detection and then provide details for these slow transactions. APM solutions have been architected and optimized for that use case which also kept overhead really low. This approach is totally fine for most traditional operations teams, but becomes an issue for real DevOps teams, SRE teams or teams that try to become more proactive when it comes to analyzing issues. Why? Because the level of instrumentation details required to understand what is really going on is not available. I believe that 2nd Gen APM tools haven’t been able to solve this problem because adding more default instrumentation would automatically lead to more overhead which is not what you want in a large scale production environment! The whole idea of monitoring is to get all your data as the problem happens. Why add more instrumentation and wait until the problem happens again? Dynatrace OneAgent, Smartscape, PurePath and AI deliver the MTTI you need! I can’t tell you how other vendors are addressing all these concerns that Dustin raised. 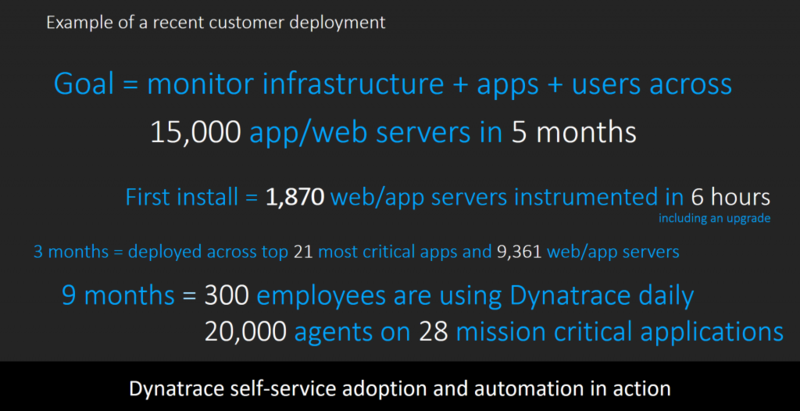 What I can tell you, is how we address it at Dynatrace. At Dynatrace, we have learned from our own 2nd Gen APM product called AppMon. While it is an amazing product that delivers high fidelity end-to-end tracing and performance data, it falls short when it comes to rolling it out to large scale environments with a high degree of technology diversity. Here are the things we have built for you – delivering the MTTI you need for todays and tomorrows technology stacks! Dynatrace OneAgent: One install, Zero configuration! 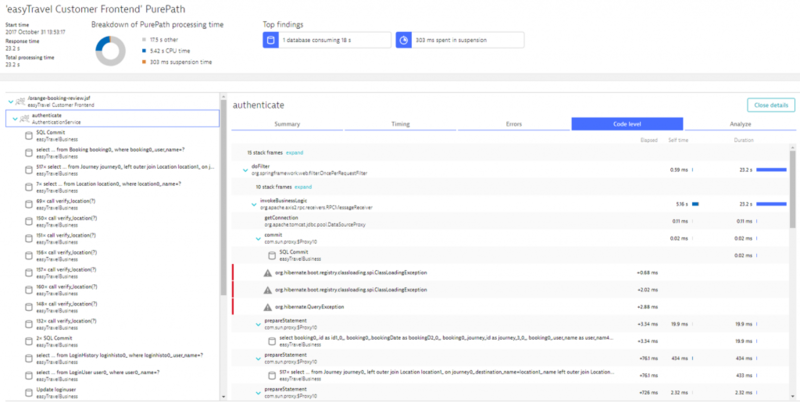 Dynatrace OneAgent comes as a single installer for Linux, Windows, AIX and Solaris. You take this installer and roll it out whenever you start a new physical, virtual or cloud instance of an OS. The agent is fully configured and knows where to send data to without requiring any additional configuration. As we have a bi-weeklyupdate schedule for our SaaS customers and a 4-week cycle for our Managed (=On-Premises) customers, we make sure that our agents always understand the latest versions of frameworks or platforms. If you move ahead with the latest version of Node.js, .NET Core or you try the latest service from AWS, Azure, Google or Red Hat you can be sure that our OneAgent already knows how to automatically monitor it. No need to spend time with custom instrumentation which would impact you MTTI! If you want to learn more about what you can do with Smartscape, check out some of my video tutorials on my YouTube Channel: Dynatrace Full-Stack Performance Clinics! 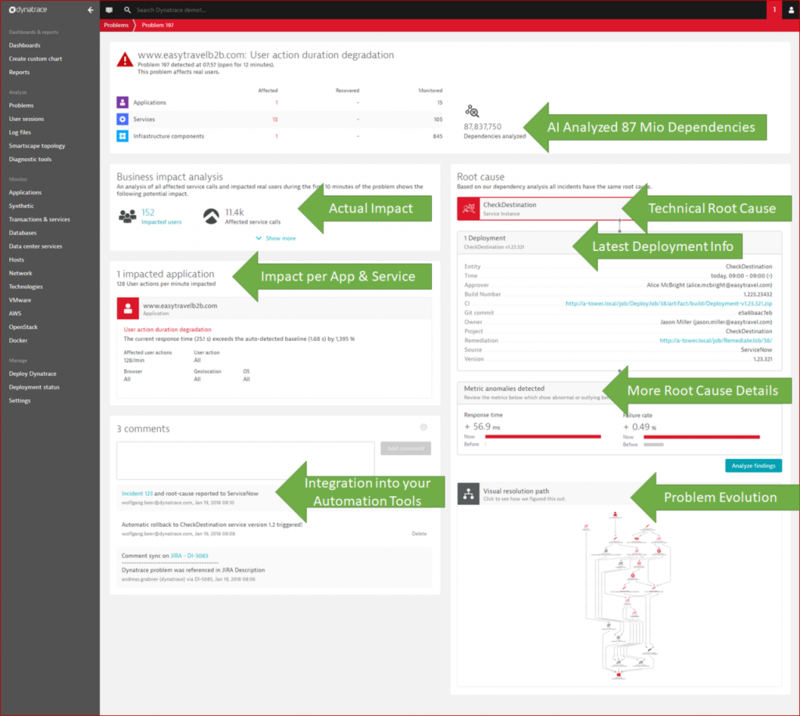 Dynatrace PurePath: Proven instrumentation-based end-to-end tracing! The PurePath updates are identical to the OneAgent experience. As PurePath gets traced by the technology specific part of the OneAgent each update we push out to our SaaS & Managed customers will make sure that the latest version updates of popular frameworks, runtimes or services get correctly instrumented. You don’t have to spend extra time fixing any missing instrumentation. We take care of that! While all this data is presented in the UI, the more important aspect is that handling problem information can be fully automated. We provide several out-of-the-box integrations with your incident management, configuration management, self-healing or collaboration tools. Faster MTTI also speeds up monitoring adoption! Reduce your MTTI: Start Today! Thanks again to Dustin for our inspiring conversation we had in Denver. Thanks for allowing me to take your idea of MTTI and write this blog. I hope I did your idea justice and you like the outcome! 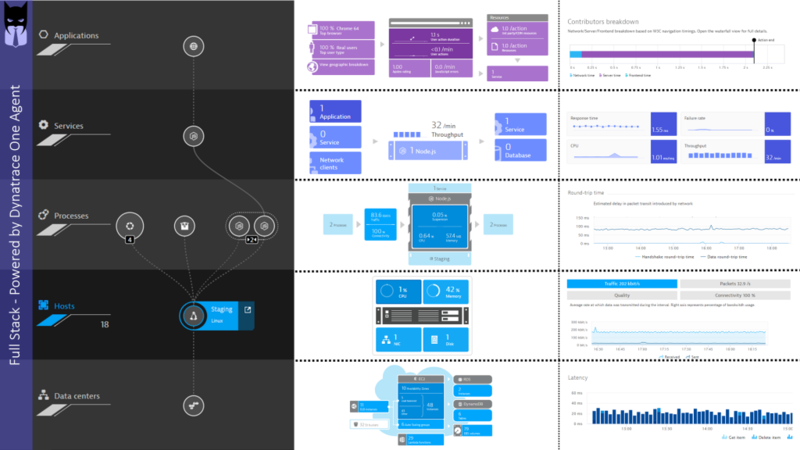 For those that want to see how Dynatrace changes MTTI in your environment as compared to what you have right now, feel free to either sign up for our Dynatrace SaaS Trial or ask us about a Managed (=On Premises) Trial.